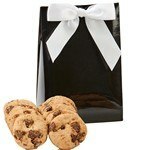 Need sweet handouts for your next corporate event, giveaway basket or as gifts for your employees? Cookies are the way to go. 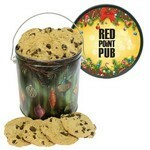 Our promotional cookie gift packages are useful, well-made and affordable. All you need to do is choose which one fits your own personal style. At Promotion Pros, we take pride in offering tons of choices - like our elegant chocolate covered Oreo gift box - to our customers, and our cookie collections are no exception. 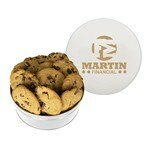 Whether you want a custom snack tin with mini chocolate chip cookie, an executive cookie box with logo or a custom promo pack bag with animal crackers, we've got it. 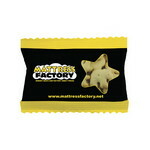 The 3 Treats Gable Box features generous filling of cookies or brownies and allows inserting custom details to Promote your Brand. 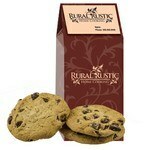 Our Snack Tin with Mini Chocolate Chip Cookies is 1 pound of delicious treats guaranteed to make your employees smile. 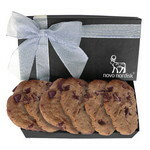 Our custom logo the executive cookie box is filled with large chocolate chip gourmet cookies. 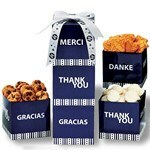 Looking for a sweet way to show your gratitude? You've found the ultimate reward with a Two-Dozen Home-Style Cookie & Brownie Basket. Make this Ultimate Cookie & Brownie Towers a part of your holiday gifts or thank you giveaways for a memorable sweet reward. Our custom logo zaga snack wide promo pack bag is a 5" bag filled with animal crackers. 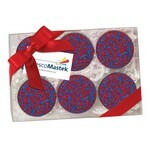 This elegant Chocolate Covered Oreo Gift Box contains six Oreo cookies and is made fresh when you order. 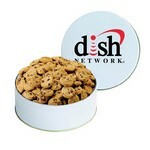 The Thank Cube Cookie Tower features cookies and nuts, Customizable with your brand logo and message. Our The Gala Box features attractive glossy exterior and makes an interesting choice for Promotional Giveaways. The Royal Tin features generously filled food treats and allows customizing the box for corporate gifts and promotional giveaways.